Personalized Badge Shirts may take a little longer than a week to ship due to number of orders coming in and time to create custom designs. Thank you for being understanding, we are a small design and printing operation. We are only creating proofs for customers that place an order. Please do not start a custom order before ordering... Thanks. CUSTOM Royal with Tees! 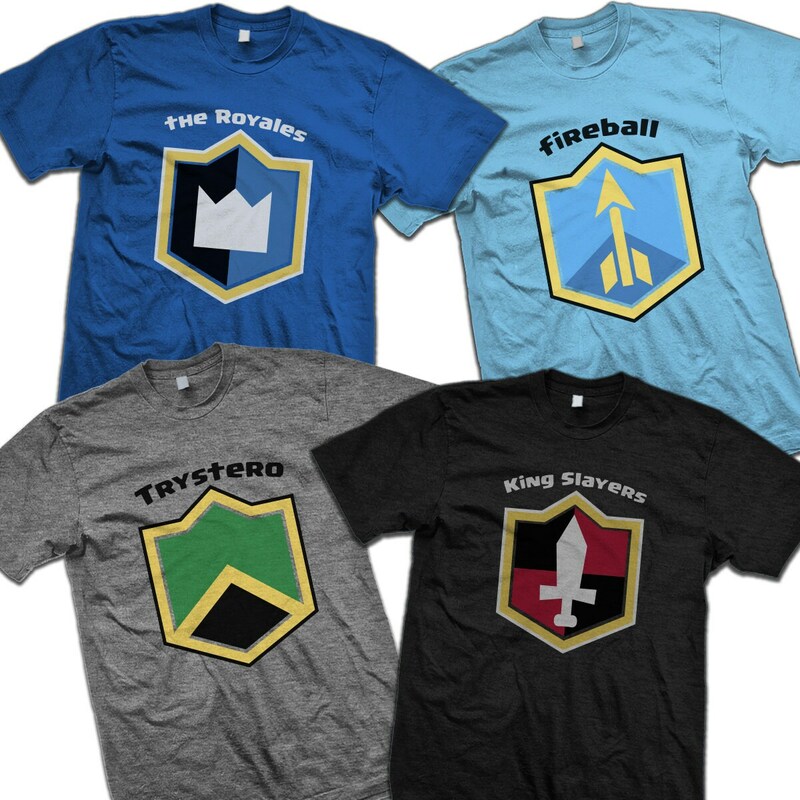 Clash With Your Clan T-shirts with personalized Clash of Clans badge, clan team name, and member name. 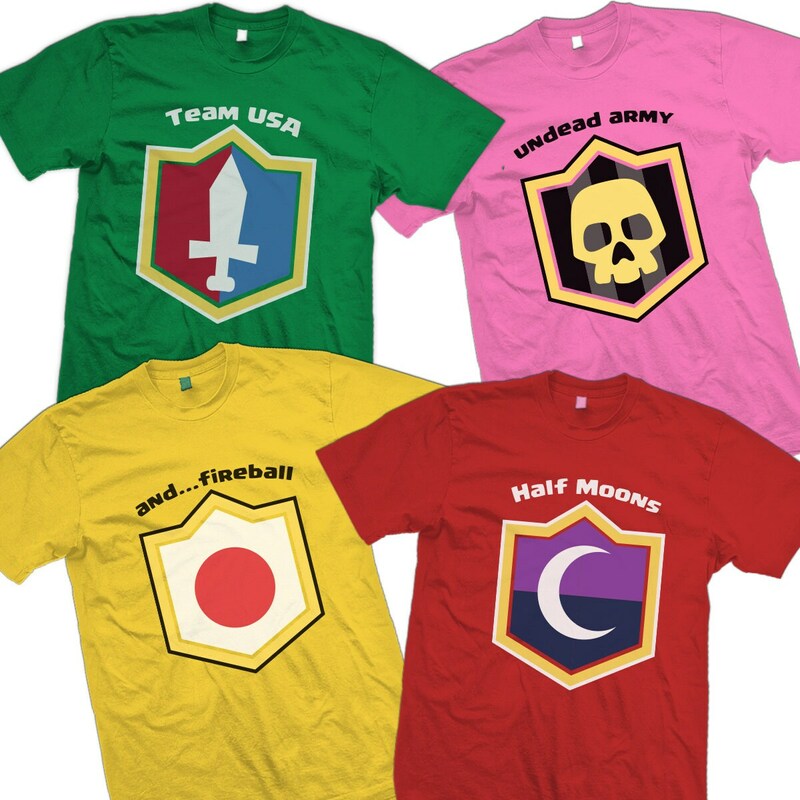 PLEASE INCLUDE A MESSAGE IN YOUR ORDER: Name of clan, image or description of clan shield, (call sign) name on back, and color of shirt you would like to use for your Clash with your Clans Team Shirts. Sending a screenshot of the badge is the best way to ensure we get it right. CUSTOMIZE: We take most Custom Requests on any order. Please let us know if you would like to change our designs a little, change a color, add text, or create a whole new design. Please send us a message if you would like a custom design created for any occasion. We will make it happen! 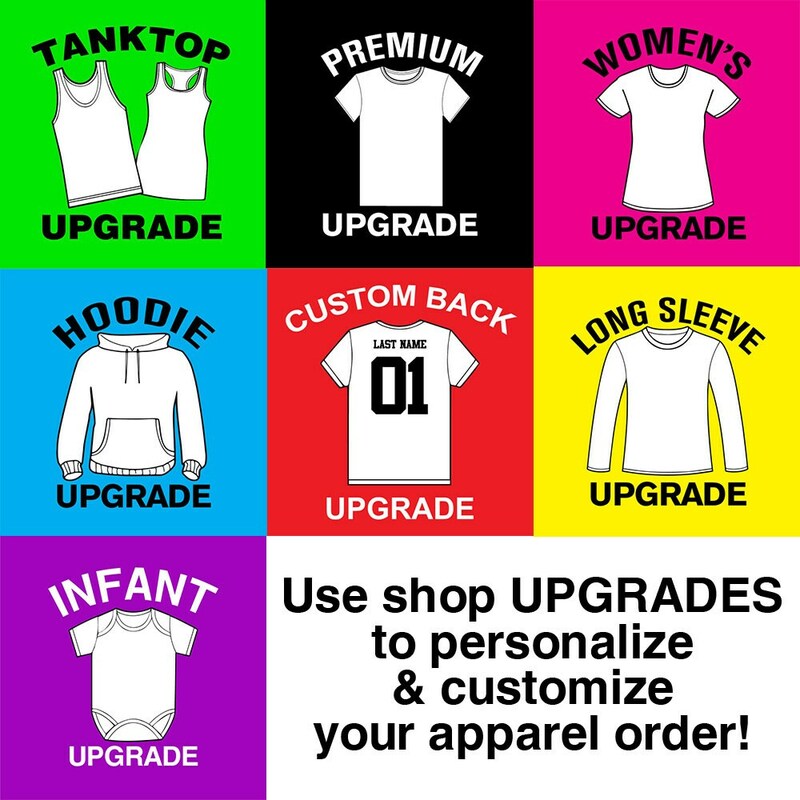 UPGRADES: Please use our shop UPGRADES with your listing purchase for long sleeves, hoodies, tank tops, or premium dual and tri blend t-shirts like American Apparel, Comfort Colors, Bella+Canvas, Next Level, and more. 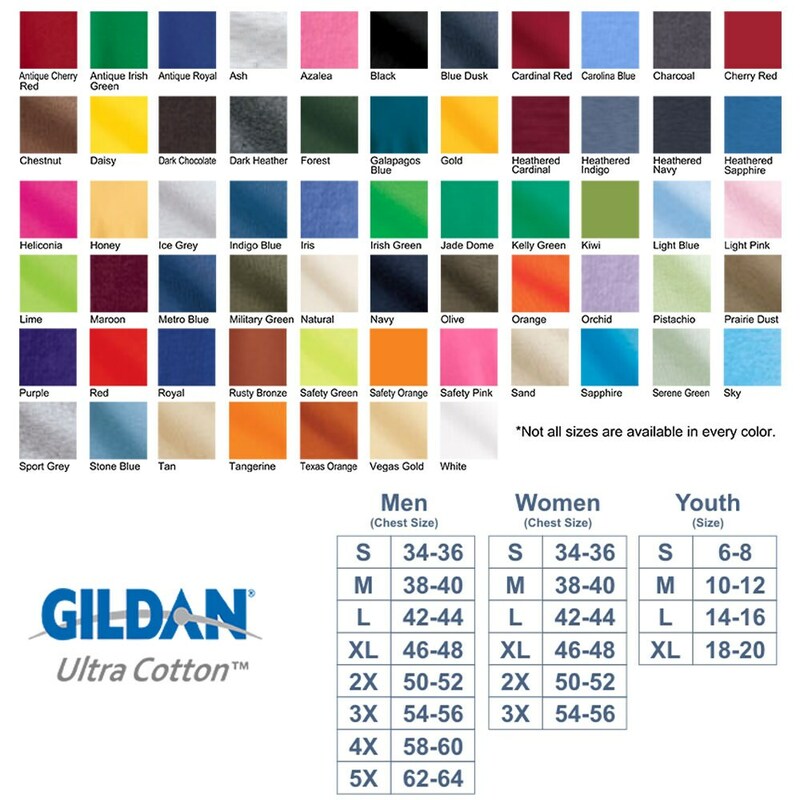 SHIRTS: 100% cotton preshrunk / crew neck / Gildan Ultra G200 - size and color chart located in last photo. Gildan is the standard in quality shirts and sizing. HOW TO MEASURE: BODY LENGTH: Lay garment flat (face down). Measure from center back neckline seam straight down to bottom of the front hem. BODY WIDTH: Lay garment flat. 1" below the armhole flat measure the garment across the chest. FULL BODY LENGTH: Lay garment flat (face down). Measure from center back neckline seam straight down to back bottom hem. SLEEVE LENGTH: Lay garment flat(face down). Measure from center back neck to outer edge of shoulder seam, then along outer edge to sleeve end. PRINTING: Our shirts are printed with high quality inks on a DTG (Direct-To-Garment) printer. These ARE NOT cheap iron-ons or thick plastisol like screen printing. This will be a shirt you are happy wearing. The shirt may arrive starchy from a pre-treatment we use before printing the shirt. The starchy feeling and any discoloring will go away after the first or second wash. SHIPPING: Our shirts are made to order and may take a little longer to prepare. Shirts usually ship within 3-5, but may take as long as 5-10 business days depending on the volume of an order and custom requests. We are a small, specialty print shop so please be patient if it takes us a little longer to reply on messages...we will get back to you as soon as we can. We are not generally open on weekends and observe most large holidays (as does the post office). POLICIES: At Chattanooga Tshirt™ we guarantee our products. We strive to maintain perfect feedback and customer satisfaction. Please contact us through Etsy if you have any questions and we will work with you to figure out a reasonable solution for most projects. Please visit our website at www.chattanoogatshirt.com if you would like a quote on a custom order. We do not offer returns on sizing issues, so please do some measuring and look at the size chart. If you have any questions, please send a message with your questions. COPYRIGHTS INFO: All images appearing on ChattanoogaTshirt.com and Etsy store are the exclusive property of Chattanooga Tshirt™ and are protected under the United States and International Copyright Laws. The images may not be reproduced, copied, transmitted or manipulated without the written permission of Chattanooga Tshirt™. All images are copyrighted Chattanooga Tshirt LLC ©2017.